Is Hydroponics Organic? Is it healthy? Well we definately want to make what we eat more healthy. Why else would we want to grow our own Veggies, fruit, herbs and so on..? But is growing our own produce healthy? Everyday I hear the same question... is it organic? Well organics is great. Organic gardening is pesticide free, using fertilizers that come from plant matter, animal matter, and also using the minerals in the soil. So if we want hydroponics to be organic, we can use a solution derived from plant matter. We wouldn't use animal matter because of e-coli and other disease issues. However, to provide the same as an organic soil system we should add minerals as well. But minerals aren't organic - they are mineral - so Hydroponics is not generally organic - BUT!!!! is it healthy - YES - probably more than organics is. Whoa there.... that's a big statement. Organics is a great idea. It is usually centered on natural and chemical free, not always complete nutrition for humans. 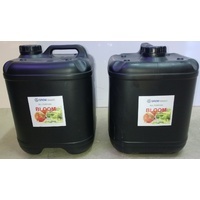 Organic nutrients come out of manures, blood and bone and composting plant matter at different rates, acidity, solubility and quantities than can be controlled. It's still good. Some collegues and I looked at human nutrition from the point of view of growing your own veggies. Several vitamin companies were already feeding plants high levels of minerals to increase their plant extracts efficacy. The suggestion was made to make a nutrient that helps humans first, a nutrient solution with over 90 elements derived from many organic plant sources (e.g. certain types of seaweed) which were then brewed like a beer, a process which is not unlike composting in the soil. The solution, now active with microorganisms is then blended with pure minerals that complete the solution. Because of this process, elements that are missing from our food chain like nickel, cobalt, selenium and others are now back in the food we grow. We call this an organic/mineral blend. To me, knowing that I can grow food that has all the nutrients that I should have in my diet, and where factors like pesticide use is up to me means this is better than organic. It is HEALTHY. This is the question we need to start asking. Is Hydroponics Healthy? The answer is Yes. There are some more traditional mineral only nutrients - these still supply a lot of nutrition. These would differ in the nutrient density that the plants provide to you. There are certified organic Hydroponic Nutrients - but they have the same issue that organics in soil has. They have got rid of the chemicals, and supplied more natural fertilisers - but have the plants really got all the nutrients they should have. Being plant based ingredients may reduce the depth of the nutrients available to being better than soil generally.... but it will vary from brand to brand. And what about Hydroponic produce from farmers? They will usually have more nutrition that soil grown and be mineral only based. So safe, healthy, but perhaps not as nutrient dense as they could be. I can't speak for all nutrients. I had a part with Joe at Grow Research in trying to produce something beyond just plant health. We wanted to deal with people's health. 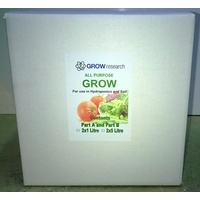 Grow research is a Organic/Mineral Blend. 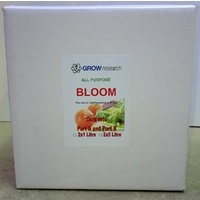 Anything with a Grow research logo is safe, and designed for healthy produce for humans. 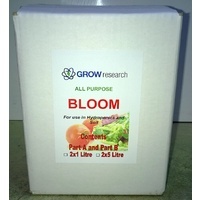 Grow research nutrients should also comply with a vegan diet as no animal matter is used. In our business we have to deal with the reality of disease. We have people who are just normal people who for some reason have cancer, fibromyalgia, Crohns disease, Parkinsons, Asthma, ADHD, Diabetes, weight challenges like obesity, and we could go on... For some, there is no time to experiment or try something. They need a healthy diet immediately, and Organics is the best start we can recommend. 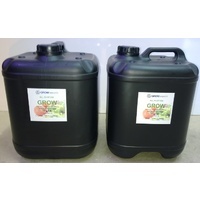 We also recommend growing or supplimenting your own food using Hydroponics. If you need help please let us know so we can get you on the easiest road to fresh produce. Plant Hybrids are generally cross bred for appearance, not nutrients or flavour. Non hybrid seeds like Eden seeds (available in our store) and other Heritage seed clubs provide original varieties of plants. Using these seeds helps make a crop which will be more favoursome and more natural than man bred plants. We are entering a world where Genetically modified plants (GMO's) and big corporations will attempt to rule our food. With Hydroponics we can grow quickly, in small areas and with less effort. By sharing our food with others who grow we can become self sufficient. It takes a small village of people to feed a village. Get some friends and family to grow the things you haven't got growing, and share with each other. I believe that food and the dinner table can make a difference in the community beyond the just the food we eat. I also know that there are legal battles being fought over the definition of Organic and Hydroponic. I don't want to weigh in on these issues as they are commercial, not nutritional. 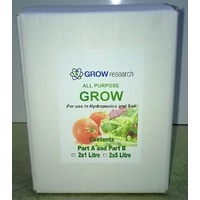 For your reference - the Grow Research nutrients below are useful for growing veggies, herbs, fruit in a hydroponic or soil environment and supply all these elements we need in our diet. And yes....they are Healthy for you!